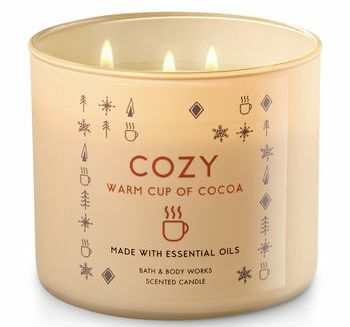 I don’t know why I’m such a sucker for cocoa scents but I am. Maybe because they’re so warm and cozy and a perfect scent when it’s cold outside? Or maybe it’s the warm chocolate scent blended with sweet vanilla cream? I think it’s equal amounts of both. Bottom line, I love it and Warm Cup of Cocoa smelled AMAZING!!!! Made with notes of milk chocolate, steamed milk and nutmeg essential oils. Steamed milk – check! Although it smelled more like a vanilla cream to me which I prefer. Nutmeg – No. I don’t smell nutmeg but that doesn’t mean it’s not there. We shall see. The true test is the lighting of the wicks and a few hours of burning. And with that said, let’s get to it. I lit this candle in my master bedroom and waited for the chocolate magic to begin. I’d say it took (give or take) about 15 minutes to reach a full melt pool and the aroma… a very subtle but smooth chocolate vanilla cream. It was yummy but too light for a large room. Once I moved it to a medium size room… perfect! The fragrance from then on out smelled like a warm cup of cocoa and it was pretty darn authentic. Nothing synthetic about it like some chocolate scents can be. I never did smell the nutmeg but I was okay with that. 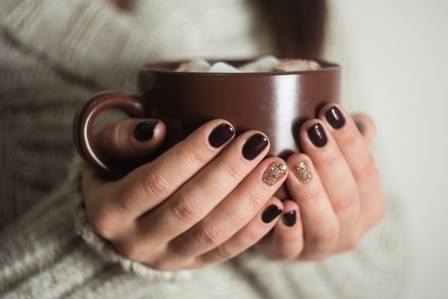 What I did smell was perfect just as it was… a warm cup of cocoa all the way. ? Strength – this candle wasn’t as strong as I hoped it would be. I would rate this candle a 6 in a really large room, 8 in a medium and probably a 10 in a small room. If you give this candle a try, stick to a medium or smaller room for the best performance and go from there. This candle was a little tricky halfway down. The dreaded wick issue hit this candle. The first half did great. Second half, the wicks did taper down to small flames and extinguished here and there which made it a pain to maintain. With a lot of effort, I did get it to burn all the way down but I shouldn’t have to do that. I enjoyed Warm Cup of Cocoa and do recommend it to all you chocolate lovers out there. Just keep in mind it wasn’t super strong for me so maybe stick to medium or smaller rooms to start out if you purchase this one. Would I buy it again? Yep. I would. It smelled yummy. I just hope my next one burns okay. We shall see. Don’t see this candle listed on Bath & Body Works website? Try one of their stores which tends to carry all of their current fragrances vs online. Not sure why that is but it’s generally the case.